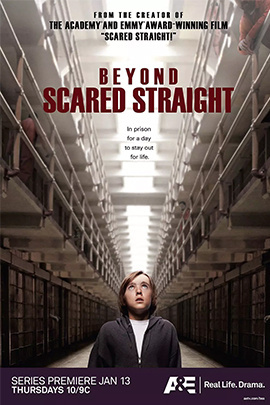 Scared Straight!, the Academy Award & multiple-Emmy®-winning documentary film by Arnold Shapiro, made a huge impact on audiences through its portrayal of an effective juvenile prevention/intervention program at a NJ prison. Over the years, both the prison program and the film have turned countless kids away from drugs, violence and crime, and kept them out of prison. BEYOND SCARED STRAIGHT™ produced by Arnold Shapiro, profiles the new approach to keeping today’s teens from becoming tomorrow’s prisoners. The power of the original Scared Straight! program has inspired dozens of inmate-run intervention programs in men’s and women’s prisons across the country. In many dramatic ways, these 21st Century programs are very different, because today’s youth need a different approach – a combination of confrontation, information and communication to try to reach these at-risk kids. These youthful offender programs put boys and girls of all ethnicities and backgrounds, ranging in age from 11-18, into intensive one-day in-prison sessions that show them the realities of life behind bars. Each one-hour episode focuses on a different inmate-run program in the U.S., and follows four or five at-risk teens before they attend the program, throughout their day inside the prison, immediately afterwards, and then follows up with them one-month later to see the lasting impact of the experience on their lives. Beyond Scared Straight is about transforming the lives of young people through intervention and second chances. Beyond Scared Straight is produced by Arnold Shapiro Productions for A&E Network. Executive Producer is Arnold Shapiro. Co-Executive Producer is Paul J. Coyne. A&E Executive Producers are Laura Fleury, Jordana Hochman and Robert Sharenow.